Here are the prices and availability of our self catering holiday cottage and lodge accommodation near Ipplepen, Newton Abbot, South Devon. Remember, if you have any questions please do not hesitate to ask. 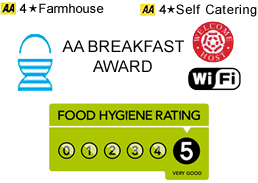 If you fancy being catered for, ask Angela to add her AA award winning traditional farmhouse breakfast to your stay. And don’t forget, she’s former AA Landlady of the Year finalist, so your stay is sure to be exceptional. Our self catering holiday cottage and lodge accommodation has character and it’s the perfect choice for a quiet getaway to the countryside. We’re close to Newton Abbot, Torquay seaside and the historic town of Totnes for plenty of exciting things to do as well.